Agarwal Homes & Developers have set standards in areas of real estate with our esteemed & trusted services, with an observation into the various aspects & amenability of the industry. 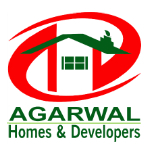 Today, Agarwal Homes & Developers is a household name across the region. The company is one of the fastest growing entities in the realty sector with a difference that offers luxury for reasonable costs, excellent customer care levels with highest customer satisfaction index and the highest imaginable standards for the welfare of its staff, society as well as for the environment. Our aim is to provide premium housing and commercials to our clients at par with international standards so as to provide benchmark quality standards and a luxurious lifestyle. However, care must be taken to keep a price line within the affordability range of the Indian Market so that people are able to afford an International Lifestyle at a reasonable price.